Blago: Why Now, And Who Pointed the Finger? It’s occurs to me in looking around this morning at the news and commentary that Send to be Ex-Illinois Governor Rod Blagojevich would’ve made an ideal candidate to run Fannie Mae or Freddie Mac. It also occurs to me, that he would not have turned dirty on us just out of the blue. This has been a pattern with him all along. That would be the usual way of it. So the question becomes, what is it that suddenly triggered all of this retribution? Now, before you get all huffy on me, thinking that I am getting defensive over Blagojevich, think again. It’s my take that he should be facing life in front of a firing squad. Thing is, given what we now know of the man, that ship should have sailed a long time ago. The chance that his kind of activities went unnoticed for all that time approaches as close to zero as no matter. The guy’s history is so questionable, and has been for so long, one cannot help but wonder how what is the manage to last as long as he did. There is only one answer to that question; those around him are equally dirty. The reputation for Illinois politics, is most certainly a well deserved one. That answer, however, leads us back to the question of: What changed? What is it that triggered all this retribution against Blagojevich now? A logical answer would be; “He made too many political enemies on his way up”. Even that doesn’t seem to explain the intensity of what he’s facing, however. Absent all that fury, all that fire and smoke, we come to the conclusion that I mentioned at the head of this column; that he would most certainly have been involved in some quasi governmental agency with a mega dollar salary, such as Fannie Mae or Freddie Mac, or he would have been involved at some level of the Obama administration. That would have been political payback as he would’ve expected it. After all, both he and Obama share the same routes in terms of their political career. They both come from the Chicago political circle. 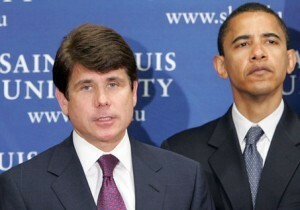 I have begun to wonder, however, if Mr. Blagojevich would be facing impeachment, absent Obama’s rise to power? Would he be facing these problems if someone other than Obama were involved? I doubt it. Now, of course one of the bigger sins, supposedly, involves Obama’s Senate seat. But I begin to think it beside the larger point. After all, we started hearing the name of Blagojevich’s corruption (and learning to spell and pronounce that name) well before the controversy of the Senate seat being sold to the highest bidder came to the fore. Think about it; But for all the investigations into the stinking mess that is Obama’s background, Mr. Blagojevich would have remained under the radar, and therefore remained Governor Blagojevich, his corruption unabated . As it is, the case against Blagojevich achieved its critical mass, and became a staple of newspapers across the country only once Barack Obama achieved political prominence on the national stage, and before his prowess as a Senate seat salesman was known. This exposes to us, two ideas at once. First, that Illinois is going to have work an awful lot harder than simply outing Blagojevich before its politics are seen as something other then a bad 1930’s gangster flick. 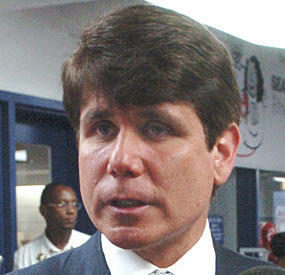 Blagojevich may be the current prize, but he’s hardly the entire problem. Secondly, and perhaps more importantly to the nation, the possibility that Obama or his people had something to do with this particular distraction showing up so prominently on cable news channels every night. While it could be argued, that Mr. Obama or his people having something to do is the political demise of Governor Blagojevich, is performing a public service, one would have to question the timing. As I’ve already pointed out, this guy’s been dirty forever. On that basis the current prosecution of the governor takes on the appearance of a prosecution of political convenience. He has certainly prove an appointive and Paris meant to Obama, who has repeatedly demonstrated that he has little tolerance for being embarrassed. As we’ve said here several times before, Obama is someone who is used to the idea of managing his own spectacle. Blagojevich became an impediment to that, clearly. The question of whether are not Obama and his people have anything to do with the Blagojevich matter in terms of its prosecution also bears on whether or not Mr. Obama was involved with Mr. Blagojevich’s misdeeds. Do we have some backside covering going on here? In short, we come to the question of what did Barack Obama know, and when did he know it? And indeed, there are a few investigations going on out there just now attempting to determine just that. It’s my belief they will fail to answer that question. Frankly, the chances of our getting that particular question answered any time soon approaches a factor of zero. no great feat for someone who was so used to the idea of managing his own spectacle.